The sago palm's scientific name is cycas revoluta. The "cycas" comes from the actual family of trees that the sago palm comes from: They are cycads, and not palms, as the name would suggest. But because there is only one real difference between these two types of plants, and because that difference isn't noticeable once the plant is fully grown, the name "palm" has stuck with little confusion. Gardeners interested in growing these striking plants might want to know more about their life cycle and how they grow, so as to make caring for them even easier. Sago palms have both male and female varieties. Seeds are formed when a female plant produces a flower and is pollinated by the cone of a male. In the wild, winds and bugs transfer the pollen from the male to the female. In cultivation, however, gardeners usually pluck the cone from the male plant and shake it over the flower of the female to pollinate. After this pollination takes place, the female plant will begin to grow the seeds, which will become quite large. The seeds will then fall from the parent plant and begin growing, if the proper conditions are met. Alternately, gardeners can remove the seeds before they fall, and thus plant them wherever they desire. In nature, sago palm seeds can usually find appropriate soil when dropped from their parent plant, since the parent plant is obviously able to grow there. In gardens, however, a little more care is usually needed to provide the correct growing conditions. Soil should drain well, and gardeners typically add perlite to regular potting soil achieve this effect. The factor that separates the sago palm from actual palms is the number of leaves on the sprout. True palms will only have one leaf, while sagos, along with other cycads, have two. It takes about three months for sago palms to begin sprouting. When they do, their root system will grow at the same time as their leaves. Seeds require warmth and ample, but not exorbitant, amounts of water to thrive. Sago palms can live for thousands of years, which means that they grow at a very slow rate. They can grow up to about an inch or so per year, though this is the high range of their documented growth. Typically they will grow slightly less than this. For most plants, the maximum height they can attain is about 6 feet, though there are some varieties that get much taller. Because sago palms are either male or female, they will have distinct reproductive organs. The females will produce a yellow flower in the center of the leaves, and the male will produce a large cone in the same location. This will not happen every year but rather every few years. Sago palms usually don't even begin to produce flowers or cones until they're at least 15 years old. 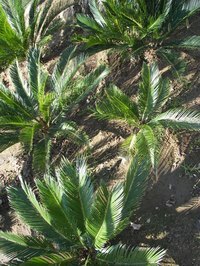 What Type of Soil Does a Sago Palm Need?